The registration fee for tackle football is $ 225.00 – there is a deposit REQUIRED at equipment handouts of $150.00. The deposit must be check or money order – WE WILL NOT ACCEPT CASH FOR EQUIPMENT DEPOSITS. If you DO NOT bring the deposit no equipment will be issued. The deposit check will be returned to you at the equipment hand ins. You must purchase a 5 piece integrated girdle for the practice and game pants. They can be purchased at any athletic store, also this year we are NOT handing out practice pants - you must purchase your own practice pants. With the start of Football being pushed back a week this year it is going to impact our ordering of Game Jerseys - PLEASE when registering your child put the correct JERSEY size in the registration - we will be using this information to order the jerseys this year. A COPY of your child’s birth certificate is required at equipment handouts. After July 24th there will be a $25.00 late fee for registration. Registration will be CLOSED August 3rd. The age and weight requirements are listed below this notice. regardless of age or weight.  Maximum Weight: 80.9 lbs., T2T- 90.9 lbs. to start the season. an additional 5lbs during playoffs.  Every player will play (1/2) one-half of every game.  Maximum Weight: 90.9 lbs., T2T- 100.9 lbs. to start the season.  13 Play minimum per game for Central Conference.  Maximum Weight: 110.9 lbs., T2T- 120.9 lbs to start the season. Conferences. 13 Play minimum per game for Central Conference. Ages 11-13: Players must turn 11 years old by September 1, 2019 to be eligible to play. turning 15 before December 31, 2019 is ineligible to play in this league. 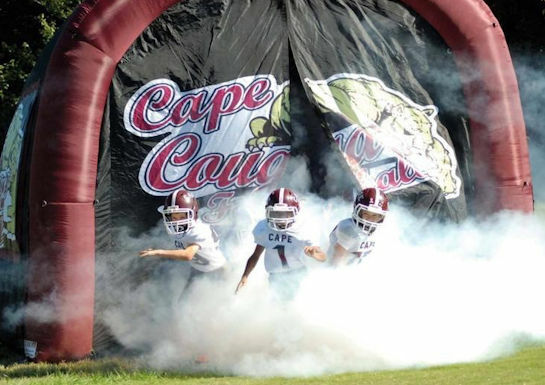 Cape St. Claire Football program is a youth tackle and flag program. Our Home Field is Bay Head Park located on Bay Head road in Annapolis (Broadneck area). The park has 3 complete fields, concession stand, Cougar fan club and restrooms, playground, pavilion, scoreboard (main field) and bleacher seating on game fields. 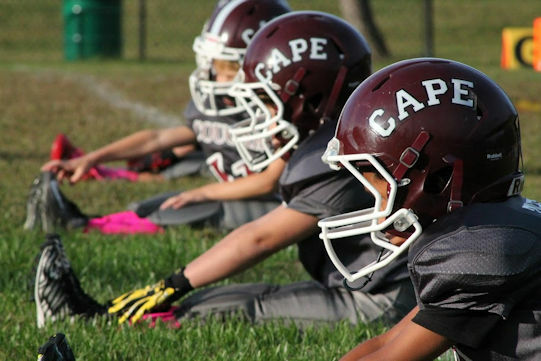 Cape's program has between 325 - 375 kids playing football. Our programs are 4-6 year old Flag football, 6-14 year old tackle teams. We pride ourselves on teaching team work sportsmanship and football skills. We added a 2 Day non-contact football camp a few years back in the summer. It's a camp designed for beginners to advanced players. We have local youth coaches along with High School / College and even NFL coaches and players that come out and coach at the camp. It's a great way to start off your season a little early. We average 90-100 kids, 6-13 years old for our camp. 2019 will be our 12th season at our wonderful park (Bay Head). 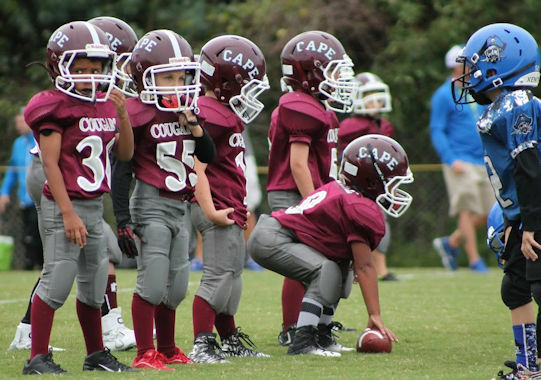 Our program has expanded to add 4-6 year old flag football and a steady increase of 10% to our tackle teams each year. We have worked hard along with AACO rec and parks to make many improvements to the park. Cape Football has installed a digital scoreboard, new media tower with full sound system, player benches; cougar fan gear club, and concession equipment. We added a seond bermuda field in 2015, new set of home side bleachers and picnic tables in the concession area added in the last few years. We also add new helmets and pads each year. We are very proud of all our hard working coaches / assistant commissioners/ concession staff and volunteers who spend countless hours who make our program a family. Cape Football has captured many county titles and State rankings over the last few season and look forward to more exciting seasons. We are also proud of our hard working players and we hope to add you to our Cape football family. Practice and Games? Practice schedule is decided by the coach. Practice can be 4 or 5 Days a week before school starts and 3 Days a week, 2 hours a night once school is back in. Games for the most part are Weekends, but sometimes they have a game during the week. Location of practice and games? Our home game field and practice field is Bay Head Park, on Bay Head road. We will play games at Home as well as locations around the county for away games. Practice will take place at Bay Head Park. What do I need? We supply a Helmet with chinstrap, one mouth guard, Shoulder pads, Practice/ game pants & Jerseys and all pads for the pants. If you lose any of these items, YOU BUY THE REPLACEMENT. Game Jerseys/ Pants are for games ONLY and practice pants/Jerseys are to be worn. If you show up with Game Jerseys or Pants for practice, YOU WILL BE SENT HOME. Players keep game jerseys at seasons end. You will also be required to hand in a birth certificate and if you played at another county football org a release must be granted from the county rec and parks, contact Jeff Porter @ rec and parks. Other important dates? The County holds 3 weigh in/ photo ID dates. Locations and Dates to be announced. The first should take place last weekend of July, 2nd sometime mid August and the last in September. If you miss the weigh/ Photo ID times you can NOT play. The 3rd weigh in is the last chance for people who missed the first 2 weigh ins, if you can only make it to the 3rd weigh in please understand that you can not play in the first 2 games of the season. Rec and Parks do not care about vacation schedules, back to school night or Fiddler on the roof plays. SO IF YOU WANT TO PLAY MAKE THE DATES. How are teams are made up? Teams are made by age/weight limit. Or if unlimited weight it's just age. There is no minimum weight only max for the weigh groups. Chart is on the main page. There is a roster limit of 15 players minimum and 30 players max. If a team has over 30 players it will be split into 2 teams. Can I drop off my kids and pick up later? Yes, but please know the times that practice ends. You need to be back 10 minutes before it's over to gather your kids. We don't want them standing around in the dark. Please make sure your Child knows they must keep track of their equipment (DO NOT LEAVE IT SITTING AROUND) equipment looks the same and will end up with the wrong person. If you are leaving or coming from another AACO football Org you are required to have a release form from Rec and Parks. Forms at www.aacounty.org/recparks Attention Jeff Porter. Must be filled out and faxed in for release to be granted. Can we get a refund for football if we don't like it? Yes you can get a refund before the posted date for refunds , with the exception of a fees posted and any late sign up fees.